BMC Fam Pract. 2013 Jan 8;14:6. doi: 10.1186/1471-2296-14-6. Prescribing ANtiDepressants Appropriately (PANDA): a cluster randomized controlled trial in primary care. Muskens E1, Eveleigh R, Lucassen P, van Weel C, Spijker J, Verhaak P, Speckens A, Voshaar RO. Inappropriate use of antidepressants (AD), defined as either continuation in the absence of a proper indication or continuation despite the lack of therapeutic efficacy, applies to approximately half of all long term AD users. 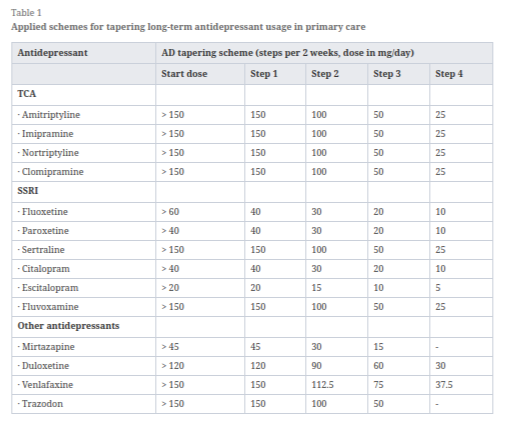 We have designed a cluster randomized controlled clinical trial to assess the (cost-) effectiveness of an antidepressant cessation advice in the absence of a proper indication for maintenance treatment with antidepressants in primary care.We will select all patients using antidepressants for over 9 months from 45 general practices. Patients will be diagnosed using the Composite International Diagnostic Interview (CIDI) version 3.0, extended with questions about the psychiatric history and previous treatment strategies. General practices will be randomized to either the intervention or the control group. In case of overtreatment, defined as the absence of a proper indication according to current guidelines, a cessation advice is given to the general practitioner. In the control groups no specific information is given. The primary outcome measure will be the proportion of patients that successfully discontinue their antidepressants at one-year follow-up. Secondary outcomes are dimensional measures of psychopathology and costs. This study protocol provides a detailed overview of the design of the trial. Study results will be of importance for refining current guidelines. If the intervention is effective it can be used in managed care programs.